A luxury underground made of marble and granite, the Moscow Metro is not just a means of public transport, but a special place full of impressive artworks dating to the epoch of socialist realism. RIR has mapped out its own route along Moscow’s most interesting Metro stations. There are 12 lines and 196 stations in the Moscow Metro, with 44 of them recognized as items of cultural heritage. The most beautiful underground in the world carries over seven million passengers daily and is the fifth busiest system in the world. The Moscow Metro envisages building 78 more stations by 2020, thus increasing its underground extension by more than 160 kilometers. 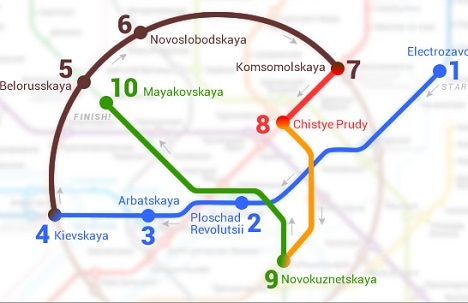 The Koltsevaya (ring) line of the Moscow Metro is unique for an underground. According to legend, Soviet leader Joseph Stalin, having listened to a report on the development of the Metro for the umpteenth time, put a cup of coffee on the project’s plan leaving a round spot on the plan. True or not, the Koltsevaya line features the Metro’s most beautiful stations and constitutes a significant part of our route. In the southern hall of one of its first stations, Sportivnaya, visit the Museum of the Moscow Metro (free entrance). Here you can find five-kopeck coins and oak turnstiles, and even the smell is unique. Start here on the deep-blue Arbatskaya-Pokrovskaya line in the city’s east. Initially it was meant to serve the Electrical Power Station and was dedicated to the study of light and industrial production. The ceiling has 318 original lamps and the bas-reliefs on the pillars of the central hall, made of marble from Prokhoro-Balandino (Chelyabinsk), are dedicated to the theme of labor and depict the Electrical Power Station’s workers, builders and smiths. Two stops later you’ll find the Ploshchad Revoliutsii (“Revolution Square”) station designed by famous Russian architect Aleksei Dushkin and featuring 76 bronze sculptures. One of the most difficult tasks for sculptor Matvey Manizer was how to fit these life-size figures into the station’s small niches. But Stalin was impressed when visiting its opening in 1938, remarking, “they’re so true to life.” Students believe that rubbing the nose of the border guard’s dog statue here brings good luck before an exam. Touching the foot of the statue of a female student is thought to cure an unhappy relationship. The next stop is part of the biggest connection hub in Moscow with three entire stations; it is the second longest station after Vorobyovy Gory. In the Arbatskaya station on the Filevskaya Line (no direct connection to this Arbatskaya station) there is a cheap and authentic café for Metro workers. Although intended for transport employees, all are welcome. It is located next to the last car from the center and is open Monday-Friday from 09:00 to 18:00. Change to the Koltsevaya line at Kievskaya. Kievskaya completed the Koltsevaya line circle and was Nikita Khrushchev’s pet project. In 1953 he was elected First Secretary of the Central Committee of the Communist Party and took the opportunity to build a station worthy of his native Ukraine. The 18 mosaics here are embedded in a stucco frame with motifs of Ukrainian ornaments. Khrushchev, having inaugurated this grandiose project, began a fight against “architectural abuses” and by doing so saved Kievskaya from its “competitors.” The station’s decorations tells the story of the mutual relations between Russia and Ukraine since the times of the “Pereyaslav Rada” when Cossacks from Zaporizhie united with Russia and took an oath of loyalty to the Tsar. It seems as if in one of the 1954 mosaics it is depicted an office clerk with a notebook and a smartphone. In fact this drapery is called “the struggle for Soviet power in Ukraine”, and in the hands of the partisan there is an ordinary field telephone. Keep going along the Koltsevaya line. When the architects devised their “arabesques” in the Belorusskaya station, they were inspired by the vaults of ancient Roman villas. At the center of the ceiling are 12 pictures that illustrate the life of the Belarusian people and the flooring depicts Belarusian patterns of embroidery and ornaments. In 1951 the station’s architects were awarded the Stalin prize for their work. Komsomolskaya was designed to be one of the city’s liveliest transport hubs and its gate: it offers the first impressions of the capital for those arriving by train, as it serves Three Station Square. Komsomolskaya was the climax of the Moscow Metro’s imperial style from the time of Stalin. It features Moscow baroque motifs in use since before the Revolution and received the grand prize at the 1958 International Exhibition in Brussels. Change trains and take the red line (Sokolnicheskaya linea) to Chistye Prudy, a station built with a top layer of limestone and a sheet of Jurassic clay. During World War II the station hosted the offices of the Chief of Staff and the Anti-Aerial Defense. Trains didn’t stop and the platform was isolated from them by plywood screens as Stalin’s office and communication center were located here. Passing trains disturbed telegraphic transmissions and blew papers off of desks. Next go to Novokuznetskaya (via changes at Turgenevskaya and Tretyakovskaya). The mosaics here were made in Leningrad during the siege of the 1940s by Vladimir Frolov when the city was dying of hunger. He was so weak when he finished that he died just a few days later. He had just managed to load the mosaics on a barge to come to Moscow. The last stop is Mayakovskaya station. Dushkin managed to create an underground palace impressive for its height, light and volume and became an instant masterpiece of art-deco style. His project received the grand prize at the 1938 World Industrial Exhibition in New York and is still considered one of the most beautiful underground stations in the world. The theme of the station’s mosaics is “a day in the life of the Soviet Union,” presenting morning, day, night and finally morning once again.